Recently I was asked to run an INSET workshop on the use of technology to promote engagement and create opportunities for learners with complex learning difficulties and disabilities (CLDD). The focus of the presentation was to look how technology can enable students to have a positive impact on their learning, the reasons for using technology, tools that are available and assessment systems that could be used. Big thanks to Ian Bean(@SENICT) and Anthony Rhys (@trinityfieldsit) as they have some great resources that are shared freely and have added links to their sites below – these were really appreciated by those who attended. Also the link to the Youtube video in the Prezi is from Anthony’s school Trinity Fields who are a real leader in using gesture based technology with their students and this impact has led them to be awarded the 3rd Millennium Award from Naace – certainly a school that we use as a benchmark for what we do. A couple of weeks ago, I was privileged to be ask to present at the SEN Computing day run and organise by Catherine Elliott(@catherinelliott) who is part of the Sheffield ILS eLearning team. So after making the long journey up North, I arrived at the venue and was taken aback with the excellent organisation and thoughts that had gone into the day (on arrival there were tables full of resources) and was looking forward to learning more about how to adapt the computing curriculum for SEN.
Over the last year, we have started to add elements of programming/coding to our curriculum. This has led to us discovering and adapting different resources to enable our students to be able to access and succeed with these elements of the new curriculum. I have written previously about some of the challenges that present themselves for students with SEN and my presentation revolved around this but also emphasised the importance of the Computing curriculum and the focus on moving students away from being consumers of ICT to creators of content. I then touch on the different elements of the KS1/2 curriculum and gave some ideas of what resources could be used to teach our students. What I wanted to emphasise further, is that it is important to remember that the computer science element of the new curriculum is only part of it and the currant elements of ICT, digital literacy and e-safety are still parts of it and are very important skills for our learners. Have attached the slides to my presentation below. 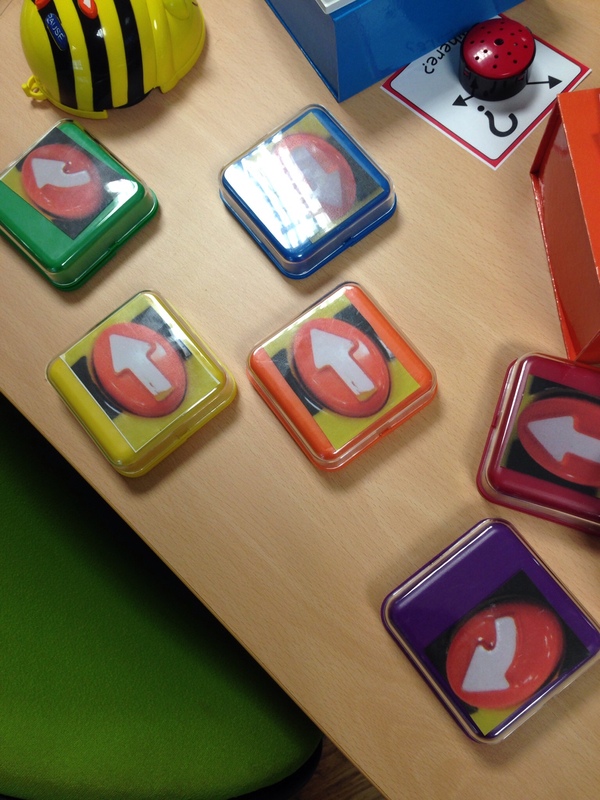 Really simple idea – use of switches to enable users learn the different arrow symbols for Logo and also enable to direct others to program control toys. Sequencing parts of a story – not only literacy links but teaches students the importance of putting things in the right order for the story to make sense. This is a important element of coding and programming and gives them an idea that computers will follow instructions logically, so important that this makes sense. 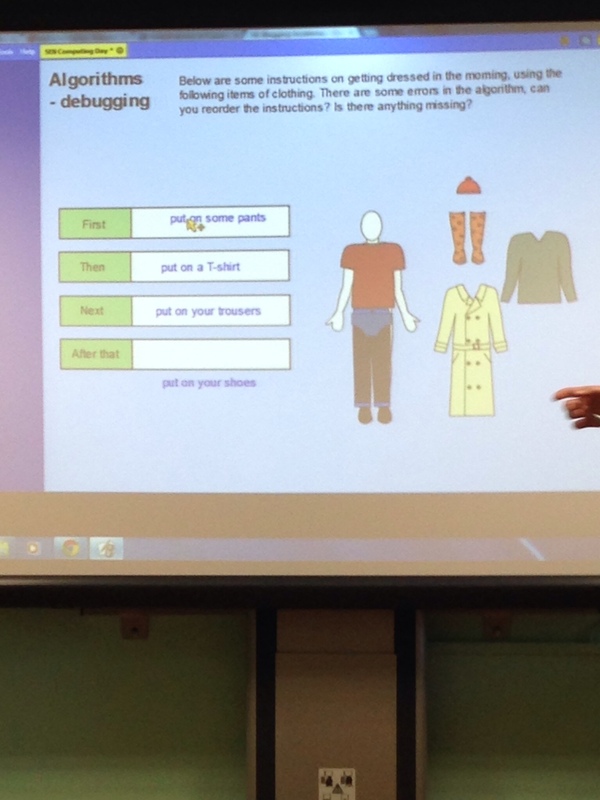 Sorting objects – what are the criteria and the use of a bubble sort activity to give students the understanding of how a computer would sort objects out by comparing items one at a time. 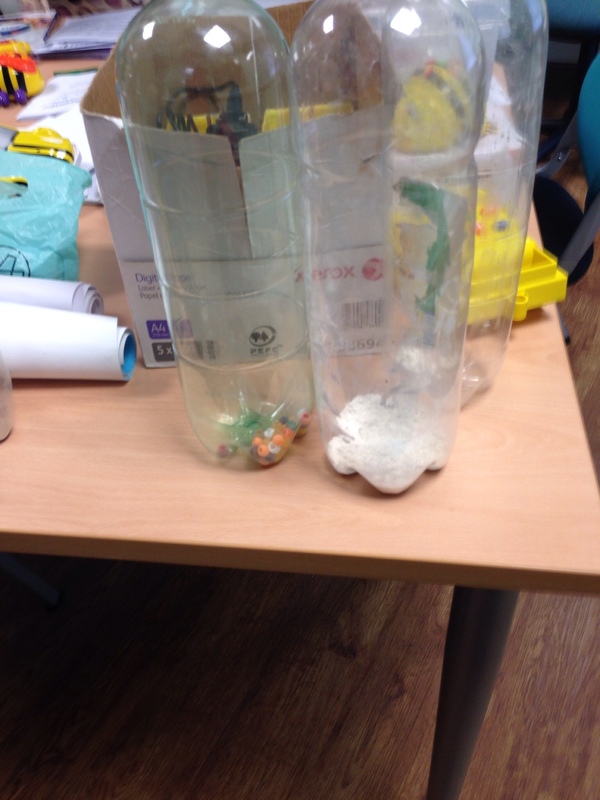 Use of different weights of bottles and a balance scale to determine the lightest/heaviest. 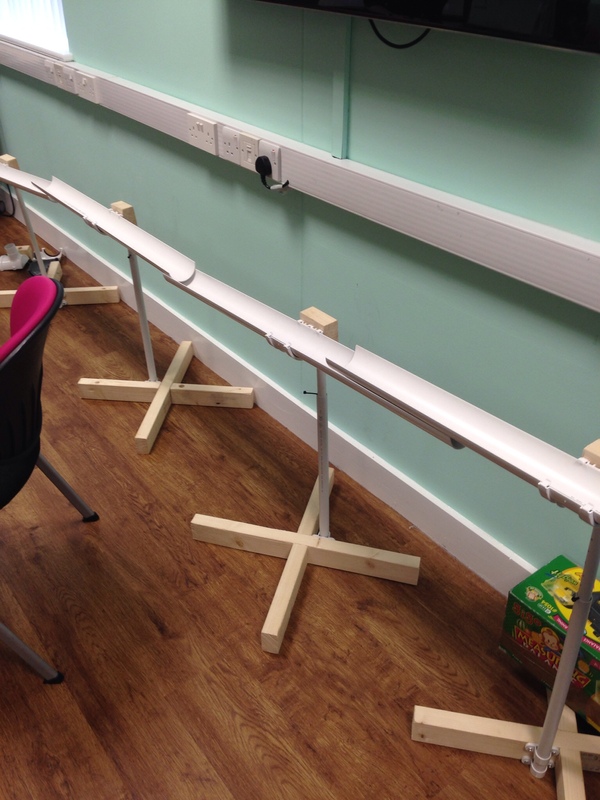 Use of real life objects to help them come up with a sequence of instructions to solve a problem – lots of examples here marble run, train track etc. 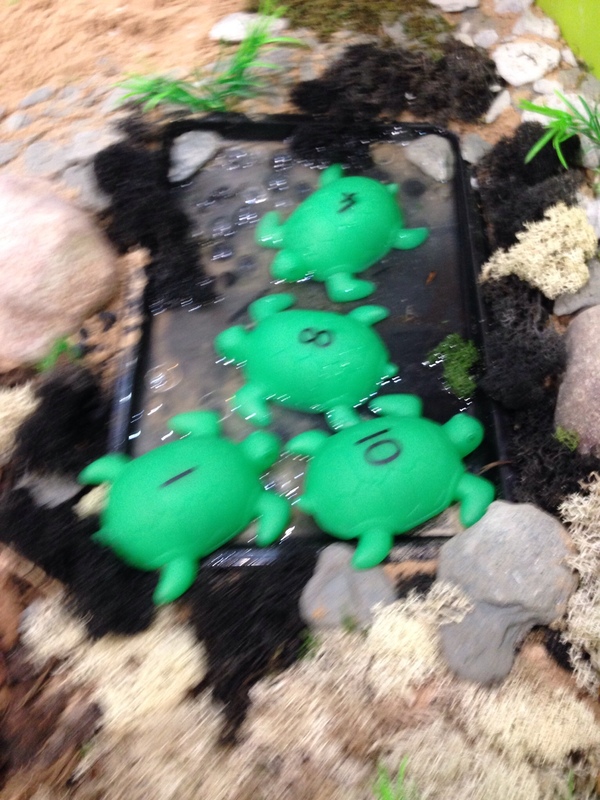 however the one I really like was the water drainage track and students would have to select what height each of the track should be to allow the water to flow down successfully. They could then write the instruction down for someone else to follow. After lunch, we then started to look at the elements of the KS2 PoS and what resources could be used to enable our students to have access and be successful. This was a very practical session and we looked at tools that lots of practitioners have written about and are using like Logo, Scratch and Kodu. Scratch is great program for teaching students how to design,write and debug programs and I have used this successfully with students at my school. Some students do struggle with their reading and distinguishing between the different blocks due to their low levels of literacy. To help with this I have used laminated version of the blocks for them to use to make up their codes on whiteboard first through discussion and then can use these as prompts when entering code onto the computer. On the day they also had versions of blocks with symbols on the back to aid students in recognising what each of the blocks do. We also touched on Kodu as well and how this resource can be used to meet the KS2 PoS. For me Kodu is the most useful tool for many of our students especially as it uses pictorial symbols when writing blocks of code so that students can quickly make simple lines of instructions to control the on-screen characters. Also in addition the use of the Xbox controller to make their inputs is great because it provides a familiar mode of input for many students and the engagement created by the use of to is an additional bonus. Unfortunately I had to leave after this session though Catherine has written some extensive blog posts on what covered throughout the day and these can be accessed here. I was really pleased to have been part of the day and it was very informative and great to make connections with other schools. As part of the conclusions of the day, it was felt that there should be an online community of Special Needs Schools to work together to share and collaborate on resources to be used for teaching the new Computing Curriculum. The wiki-space has been set up here – www.sencomputing.wikispaces.com If you want to become a member contact Catherine, via the email address on the site. Anyway the day was great and it nice to here from very inspring professionals like Simon Humphreys who coordinates Computing at School and Claire Lotriet (@OhLottie) who both gave excellent presentations about the content of he new computing curriculum. Across the day, it was said lots and lots of time that the new commuting curriculum is not all about coding and that in encompasses digital literacy/e-safety and ICT as well and that the focus should not be all about computer science. I talked about the challenges that students with SEND face and how we could overcome them. I also talked the about how it was important for the content providers to consider adding the ability to change fonts, think about different modes of access etc to enable our learners to be successful in demonstrating their knowledge and not be blocked by these barriers. I also touch on the importance of teaching computational thinking away from computers and link it to other areas of the curriculum. Have attached a copy of my slides here. What was nice about the day was the opportunity to speak to other practitioners from special schools who had come (I did wonder if I was the only one in the room) and make links with them. I feel that as a special needs community we need to work together to produce resources and collaborate on what works well for our students. In the end of the day it will be what we do in the classroom that’s makes the difference and if we wait around for Government and other people to produce content to match mainstream it could be a long wait. I have mentioned in another blog post about a wikispace set up specifically with the aim of sharing and collaborating on SEN and Computing the link is here. Sign up and help us make this resource even better, it would be great to work with other special schools and share what I know is fantastic work being done by schools. As a school we have a long history of avoiding educational bandwagons and faddish approaches to improving outcomes. Our view of what are priority changes to our practice is driven by highly detailed reflections on the progress that our pupils make, built directly into our School Development Plan. As such we have a very clear vision regarding to what we need to do to be better and this is focussed firmly on the children. This year, I once again got to travel up to the big smoke and attend BETT to see what had change in a year since the last time I visited. Though I was certain not a lot had change, I was excited to not only be proven wrong, but the opportunity to meet up with fantastic practitioners was lure enough to make the journey. This year was different in that I had a slight plan of action to ensure that I covered everything that I needed to. I wanted to explore the different interactive boards available especially one that would cater for PMLD, discuss and try out different software available for Eyegaze and look at some of the other smaller stands to seek out unique products that could make a real difference to the teaching and learning of our SEN students. The SEN zone on the whole was massively under represented again, with the majority of stands showing off their ideas of a interactive wall and floor displays. It really infuriates me that these companies can charge such high premiums for their installations (£9800 in one case) where with a little know how, you can do your own installations at a fraction of the cost using Kinects and webcams. 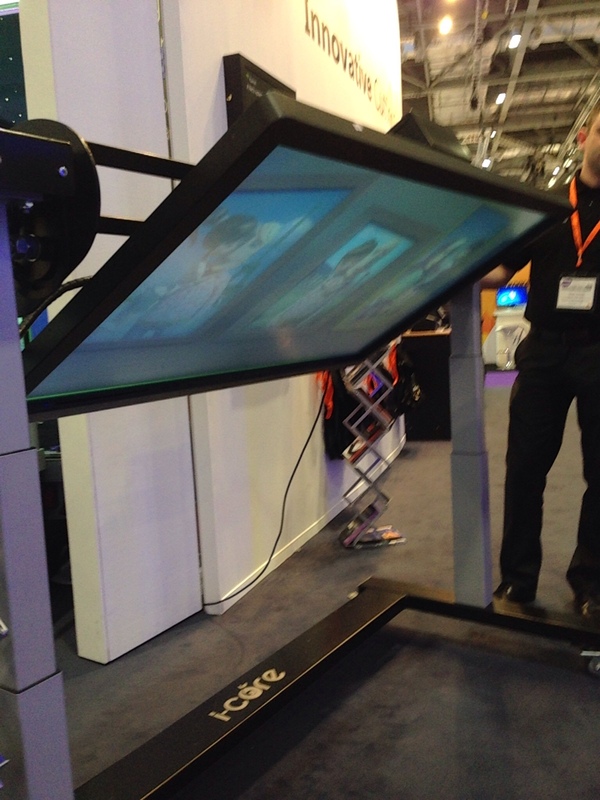 (Quick plug – head over to GestureSEN to see what a group of schools are doing with this technology) Anyway moan over, onto the highlights of what I saw at BETT this year. 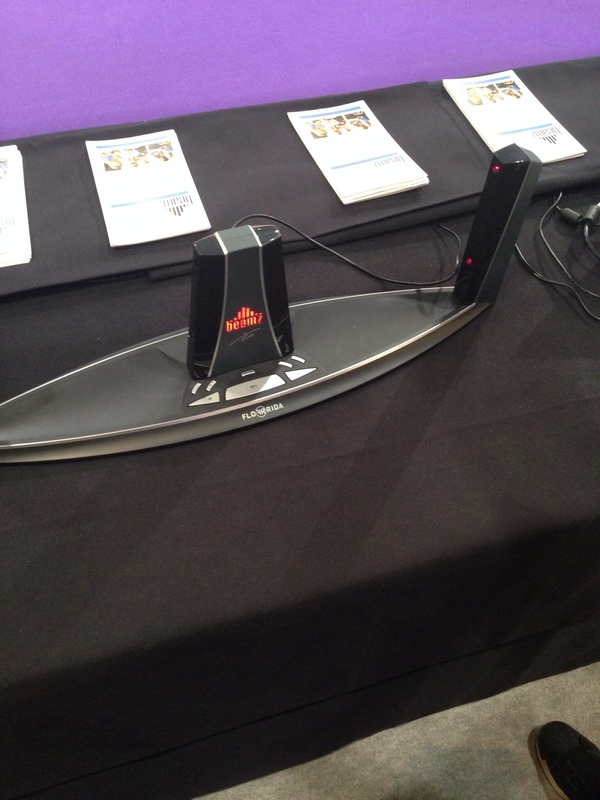 I was pleasantly surprised when I saw this at BETT. It is a universally designed laser controller that gives users instant access to hundreds of musical instruments, sound effects and songs. It works by users breaking the beams to trigger a instrument. There are 4 beams which can be set up to play different instruments. The nice thing about this is that each instrument is played in tune and users can either play single notes or break the beams to play the instrument continuously. This is great for cause and effect, sequencing, fine and gross motor skills and working directionality with students. The added bonus of this system is that it can be used with switches, adapted keyboards and the accompanying iOS app so this makes accessible for a large range of students. It is also Eyegaze compatible!! Lastly the price is very affordable for schools and I was shocked to hear that it only cost £250 for the hardware, software and accompanying activity guide. My order will be going in soon!! 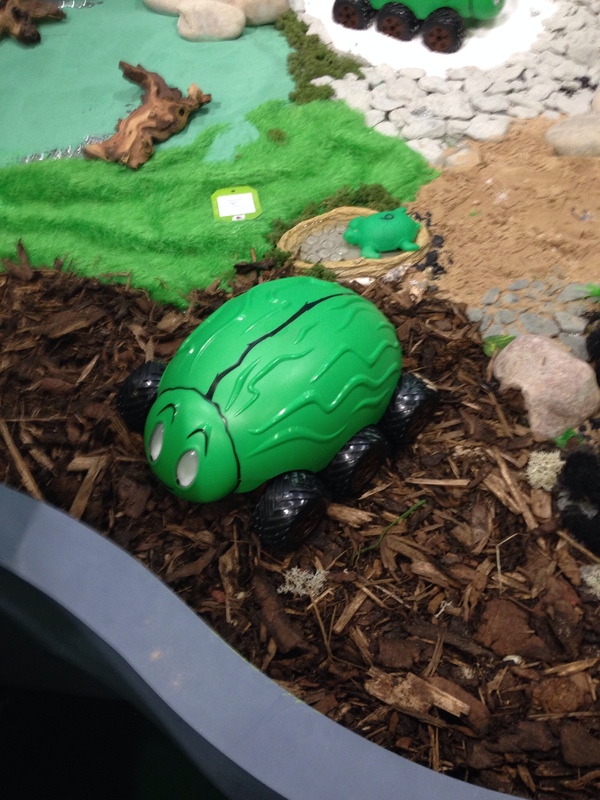 Talking Turtles – these are a waterproof set of recordable turtles which could be used in sand, water and other sensory materials. You are able to record a message on them that could correspond to the numbers in them to reinforce mathematical understanding. Talking Daisy’s and Tree – again another resource that you are able to record messages on. 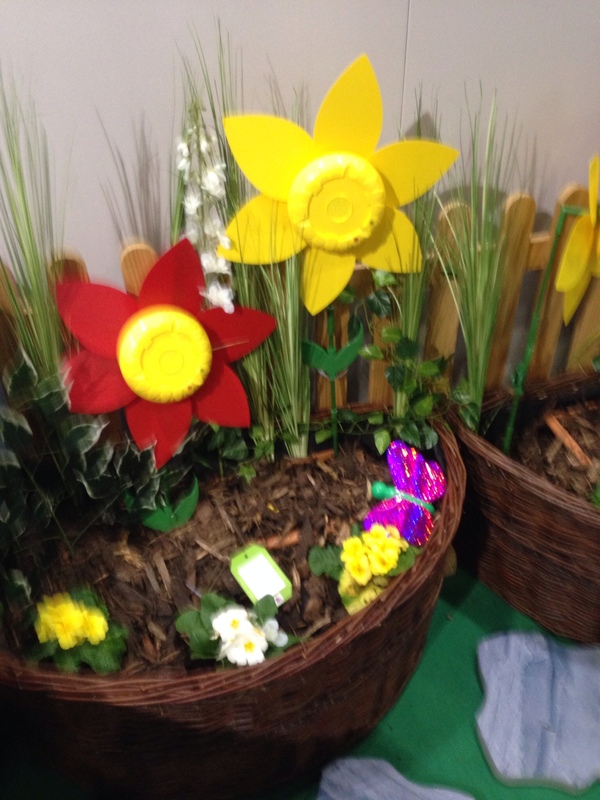 They would be a bright and attractive addition to a outdoor area and great for working on speaking and listening skills – talking number lines, treasure hunts etc. The great thing about these is that they can be left outdoors so no dragging them back and forth to the classroom. Wonder Bug – this could be describe as a rugged outdoor Beebot. It can be used in all conditions and could add to some great adventures in the woods. Also can be used with washable paint so you could use it to create some great artwork with your students. We have used Hills Components for a while now for projectors mounts as they offer great value for money. When I visited thier stand I was interested to see that they had launched a new website and this came with a number of new products. If you order in bulk many of the items can be purchased at very low prices like the £10 iPad mount which I will mention below. Unbreakable Headphones – this look like an excellent purchase for many schools especially in special ed as we seem to be breaking headphones left, right and centre. They come with a braided cable, steel tensioned headband and anti pull cables on areas where traditional headphones break. Again great value especially when purchasing a bulk order as the price comes down to as low as £3 per headphone. iPad mounts and stands – they had a range of iPad stands and mounts and it’s worth exploring their website further as their prices seem very responsible on comparison to others. 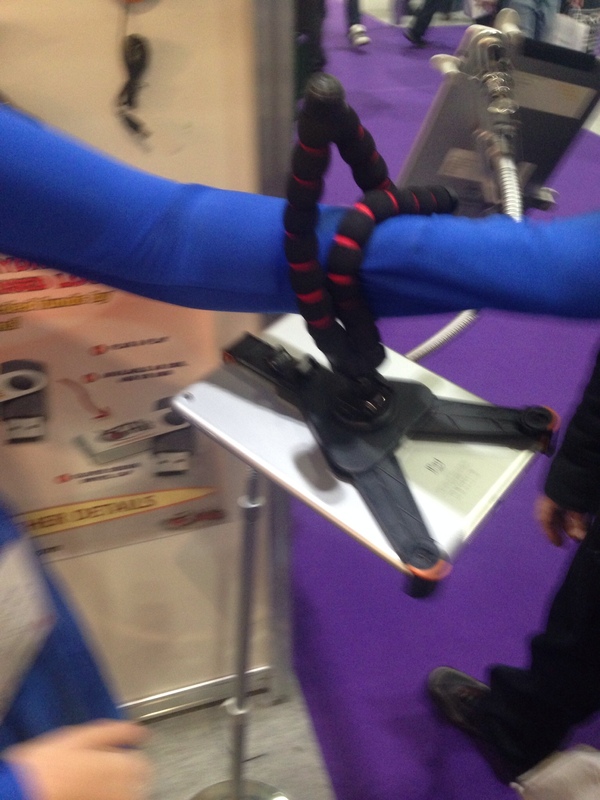 They also showed us iPad mount for wheelchairs that allowed the iPad to be clip in and off when you need it to. The RRP is £29 however as they are an educational supplier if you were to bulk order these the price could come down to as low as £10, which I think is very competitive. 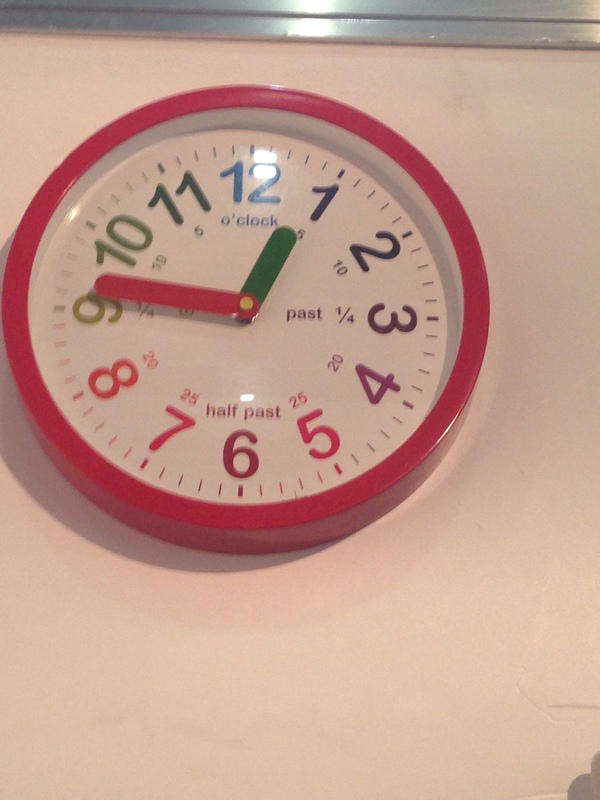 Acctim Lulu Teach Time Clock – I really like the look of this clock and think its bright colours give an alternative and fun way to teach the time. EyeGaze software – though it’s taking some time to be released, the software that Inclusive are working on looks like a great addition to the range of EyeGaze technology. Some attractive and fun activities have been designed with the added inclusion of assessment tracking to enable to see how students are progressing with their use of EyeGaze technology. One of my briefs for the show was to explore what interactive mobile smartboards there were which would be suitable for PMLD students. The main thing I was interested in was a board that enable access for students laying on a bed or reclining back in their chairs. Many boards would tilt into a table but when it came to tilt the other they did not make the grade. I was about to give up hope, when I got directed towards the Osborne stand. iCore Flip 180 – finally I found the board I was looking for!! What is great about this is that is has full 180 degree tilt so can go from being a flat table to being turn upside down so that students can access on a bed if needed. It is also height adjustable so lots of different angles can be achieved. This is certainly a product that I am going to explore further and I they offer free trails to ensure that it is the right product for your students. Overall, I really enjoyed BETT this year, it was great to meet up with Andrew Walker (@andtomac) and Susan McCarthy (@SusanMcCarthy) from the gesture based PLC plus meeting Sarah McDonald (@daisyrah) for the first time. In addition I had a very interesting chat with Hector Minto (@hminto) about the development of EyeGaze and I am looking forward to our school investing in this technology. I also attended an excellent seminar by Carol Allen (@caroljallen) about the technology and autism and then enjoyed a great chat with her over coffee, discussing a range of topics. Lastly the Teachmeet was an excellent event in the evening with a great range of speakers and some excellent class tools to take back to school and share with others. Big thank you and well done to the organisers for putting on a fantastic event. Even though it was a long day, it was certainly worthwhile and I am already looking forward to attending next year.